Mudcrutch | ★★★★ | Mudcrutch | Warner Bros. Even a dude with a track record as golden as Tom Petty's needs to reflect on paths not taken. Mudcrutch, Petty's pre-Heartbreakers band, released a single and little else in the mid-Seventies. And that's too bad, since they reunite here for a hot country-rock set that clearly aspires to, and gets within spitting distance of, genre classics like Sweetheart of the Rodeo, The Gilded Palace of Sin and American Beauty. If the Heartbreakers had never happened, this band would have worked out just fine. Mudcrutch has more jammy, expansive guitar work than any Petty record ever. Yet the leader doesn't play a lick, shelving his Rickenbacker to play bass, as he did back in the day. The twin-guitar front is Heartbreaker Mike Campbell and Tom Leadon, a dazzling player who found less fame than his brother Bernie (Eagles, Flying Burrito Brothers). The pair duel on the hot-pickin' traditional tune "June Apple," run Allman Brothers tandems on the boogie-rock "Bootleg Flyer" and space-waltz Dead-style on the organ-swathed, nine-minute "Crystal River." Heartbreaker keyboard whiz Benmont Tench and journeyman drummer Randall Marsh complete the original lineup; everyone's back, and better for it. 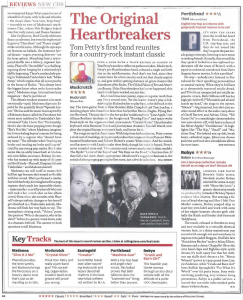 The songs are mythic Americana: With help from his bandmates, Petty creates a vivid cast of road dogs, strippers, and junkies that conjures Gram Parson's Bible-haunted Southerners and Robert Hunter's cosmic Westerners. And his weathered harmonies with Leadon make them flesh; even though his voice is frayed, Petty's never sounded more real. Two country-rock covers nearly match their models: The Byrds' "Lover of the Bayou" and "Six Days on the Road," a Burritos fave. If they fall a tad short, that's appropriate: Mudcrutch's ragged enthusiasm is the sound of a hungry gang getting its first taste, just a few decades late. Think Tom Petty isn't really a jam-band guy? This sprawling, organ-laden, Grateful Dead-style groove will prove you wrong.